One of my favourite spiritual books is the Bhagavad Gita. It, perhaps, is the reason I stumbled into my love of what could be called Eastern Spirituality or Eastern Mysticism, and the Gita was one of the first few holy texts I read. It contains a number of different but intricately related teachings that, together, knit the fabric for a beautiful teaching. It also has an epic and somewhat unusual setting, for a spiritual text at least, namely the battleground of Kurukshetra in which Arjuna is seeking advice prior to going into battle from his charioteer, Krishna. It just so happens that Krishna is in fact God incarnate, and so a wonderful dialogue and spiritual discourse commences. I do not consider the Gita to be a perfect text, for a number of reasons which I will not delve into in this post, but for many years it has seemed to me that there is a glaring error in its current format, one that I have not heard much of, and one that can be easily rectified. In fact, when this error is seen and rectified, the Gita, in my opinion, is much more satisfying to read, albeit still with its imperfections. What is the error? It is that Chapters 3 and 4 are the wrong way round. It took me a while to figure this out, and I wonder if this idea has occurred to other people too? A quick google search has not revealed to me that other people have noticed this. However, surely for any discerning reader, the transition from Chapter 2 to Chapter 3 is jarring in the very least. I remember feeling this jarring sensation when I first read the Gita, but as I said, it took me a while to figure out its resolution. Chapter 1 sets the scene of the ensuing battle, and it is in Chapter 2 that the main spiritual teaching begins. After Arjuna collapses in a fit of despair, panic and disillusionment and asks Krishna for help, Krishna gives a broad outline of the main teachings of the Gita. 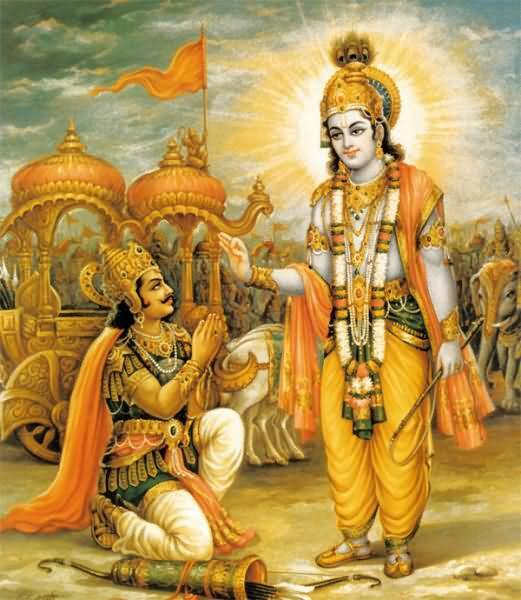 Krishna tells Arjuna that he need not fear, that the essence of him is eternal and indestructible, and that he should perform his noble duty with honour. Krishna, still in Chapter 2, then goes on to describe the path to spiritual liberation, the path of yoga in which one should be equanimous of mind amidst daily life and also practice withdrawing the senses and enter into a meditative samadhi in which the mind is controlled and allowed to become still, unphased by sense-objects and desires. Krishna spends a considerable number of verses on this theme, finally stating that this will lead to the attainment of Brahman, or the Absolute or God, in which there is no suffering or delusion. 3.1 O Krishna, if you say that knowledge is superior to action, why ask me to fight in this terrible battle? 3.2 My mind is confused, your words seem contradictory. Please clarify to me which path will lead me to the greatest good? 3.3 Krishna said: Arjuna, as I have told you before, there are two paths of faith: the path of knowledge (Jnana Yoga) for the philosophically inclined, and the path of action (Karma Yoga) for the active. Without swapping Chapters 3 and 4 around, this verse makes little sense. Krishna has not yet outlined two yogas, that of Jnana Yoga and Karma Yoga. He does, however, outline these in Chapter 4. This makes complete sense as the start of Chapter 3 and would avoid the jarring switch to Arjuna’s question about the two paths that are not described until later on in the current text. What Krishna explains in Chapter 4 is a logical continuance of explaining the origins of the yoga described in the latter part of Chapter 2. In Chapter 4, Krishna goes on to reveal to Arjuna that he, Krishna, is not merely a trusted friend and charioteer, but actually God-incarnate who manifests in every age when he is needed to impart spiritual wisdom to humanity. He briefly describes the benefits of worshipping Him and other Gods, and introduces and explains the teaching on the path of action or Karma Yoga starting at around verse 4.14 to around 4.32. 4.41 One who has given up action through yoga, and has dispelled doubts by knowledge, one who lives in the Self, is not bound by action (karma). 4.42 Therefore, Arjuna, with the sword of knowledge (jnana) remove the doubts in yourself, and taking refuge in yoga, stand and fight. Given this context, with Krishna having just explained the two seemingly different paths of karma yoga and jnana yoga, and then ended his discourse by stating actions are to be renounced (4.41), and then to stand and fight (4.42), it is completely understandable that Arjuna is confused. His questions in verses 3.1 and 3.2 (see above) make complete sense now and we lose that jarring sensation that was previously present when we go from Chapter 2 to Chapter 3. Krishna’s response in 3.3 also makes more sense in this context, as if we switch chapters 3 and 4, Krishna has just told Arjuna of the two paths: ‘Arjuna, as I have told you before, there are two paths…jnana yoga…and karma yoga..’. Chapter 3 (what should in my view be Chapter 4) then explains and extols the virtues and benefits the path of karma yoga more fully. 5.1 First you recommend giving up work [ie. chapter 2 in which sense withdrawal is advocated] and then you recommend work in yoga [ie. chapter 3 in which karma yoga is advocated]. Please tell me clearly which path is best. Again, this makes more sense if Chapter 3 was actually Chapter 4 – otherwise why wait a whole chapter before asking this question? The whole thing flows much more like a normal conversation with Chapters 3 and 4 swapped around. Chapter 5 then says how both paths lead to the same goal, but that the path of action/Karma Yoga is superior. Only at the end of Chapter 5 is the topic of meditation and withdrawal of the senses from the sense objects again taken up in verse 5.26-5.28. Chapter 6 then goes on to explain how both paths end up with the mind being stilled, and that to start off with, the path is yoga in action, but the path ends with stillness of mind (verse 6.3). The rest of Chapter 6 is devoted to the path of meditation and stillness of mind, with a few verses now introducing the teachings of Bhakti (devotion to or love of God) in verses 6.29-6.32. With just the simple swapping around of chapters 3 and 4, in my view the potency and philosophical narrative of the Bhagavad Gita greatly enhanced. Themes are introduced in a wonderfully natural and logical way, with one theme leading into another – a beautiful and coherent development of ideas, as follows: from an overview of the teachings in Chapter 2, to an introduction to the two main paths in Chapter 4, then firstly focussing on the path of action in Chapters 3 and 5, and then to the more advanced path of meditation in Chapter 6, and then the introduction to Bhakti, a theme that is progressively developed in the next 6 chapters (chapters 7 to 12). Chapter 1: the battle scene is set and Arjuna falls into panic and despair at the thought of going to war. Chapter 2: reassurance given to Arjuna by Krisha who also gives an overview of the path, with a large focus on the yoga of renunciation, stillness of mind and meditation in the latter part of the chapter. Chapter 4: Krishna explains how this yoga has been taught to previous generations and then introduces the two paths of Karma Yoga and Jnana Yoga. Chapter 3: Arjuna asks which of these two paths is superior. Krishna explains the value of Karma Yoga and explains this more fully. Chapter 5: Arjuna persists with his question about which path is better, and Krishna states both paths lead to the same goal, but Karma Yoga is better. Chapter 6: Krishna then states that beginners start with Karma yoga, but as one advances stillness of mind and the yoga of meditation becomes more important. Themes of Bhakti are introduced. Chapter 7-12: The theme of Bhakti is further introduced and the nature of God and devotional worship is elaborated upon. Chapters 13-18: the path of knowledge, special or specific teachings, and concluding instructions are given. So, what do you think? Is the way I am looking at it correct? Even though I have been reading and studying these texts for over 20 years, I do not consider myself to be an expert and I am not a sanskrit scholar either. My suggestion is to simply swap around chapters 3 and 4 when you read the Bhagavad Gita. Please let me know your views in the comments. After read through the complete post of findings by you, only can say B.Gita is not a mere epic or book. There are many things which contradicts without knowledge that to highest form of realisation because findings are within limits other than few, just for expl. Bhagaban Ramana Maharshi. It’s complete realisation which can reveals all the roots n everything’s of Gita. Gita is not contradictory but it must be realise. May refer you to go through Swami Argadanandji’s Yatharth Gita hope will satisfy you by always 60-70%. I think my above comments don’t really change the essential teachings on the Gita. In a way, this post of mine is a superficial diversion, but may be of interest nonetheless. Thanks for taking the time to write your response and disagreement. It’s good for readers to see a well-researched counter view as the one you have provided, and a healthy disagreement can foster much growth and learning – so thank you. That said, I think you have mistranslated verse 2.39 and therefore also misunderstood verse 2.49. These are the two key verses upon which your argument stands. I think you have also misunderstood the term ‘buddhi yoga’ as it is used in the Gita, as I will try to explain below. Thus far I have taught you Sankhya (ie. knowledge). Now listen to Buddhi yoga (this wisdom concerning yoga). Endowed with this wisdom (buddhya yukto) you will be free from the bonds of karma. The term ‘buddhi-yoga’ is actually referring to karma yoga as is clear from the context. A better translation for ‘buddhi-yoga’ is ‘wisdom in yoga’ or ‘knowledge of yoga’. So Buddhi-yoga is referring to wisdom in the path of yoga ie. karma yoga). Even Shankara, the proponent of knowledge, in his commentary acknowledges this, and I have not seen a translation of the Gita that disagrees. Krishna then goes on the explain the path of yoga, ie. karma yoga, in the ensuing verses, further strengthening this interpretation. Certainly avoid inferior actions by wisdom in yoga (buddhi-yoga), O Dhananjaya. Seek refuge in this wisdom. Those who desire the fruits of their actions are impoverished. The latter part of this verse ‘Those who desire the fruits of their actions are impoverished’ is clearly referring to karma yoga. The only logical translation of buddhi-yoga here, as before, is that of referring to wisdom in karma yoga, or evenness in mind during action in which the fruits of actions are not desired. Again, Shankara in his commentary on this verse says this too. Even without Shankara’s commentary this should be obvious in the context: both verses 2.48 and 2.50 either side of it are also promoting the path of (karma) yoga. Verse 2.48 states that one should be established in yoga and that yoga means evenness of mind (ie. karma yoga), and 2.50 makes it even clearer that ‘buddhi’ refers to the path of yoga when it states that one possessed of this wisdom (buddhi-yuktah)…should be devoted to yoga… The same verse then goes on to define yoga as karma yoga (yogah karmasu kausalam). Regarding the your argument about the title headings, you may have not realised that the original Bhagavad Gita has no title headings – these have been put in place by the various different interpreters and translators and vary quite a bit, depending which version of the Gita you are reading, who has translated it, etc. Quite apart from all of the above analysis, and even if I were to be wrong on the above, there is another reason why I think I am right on this: it is a much nicer reading experience to read the Gita when Chapters 3 and 4 are switched. At least this is my experience. The book speaks to me with more force and logic, and flows so much better. The authors of the Gita were masterful in their art of composition, and the current format leads to much confusion. It fits much more beautifully this way, in my view at least. Try it, if you haven’t already! Many thanks to your response to my comments. This whole issue requires further study, which I will do in due course. I have four translations and commentaries, including Shankara’s which I will go through and get back to you. In any case your view that KRISHNA does not say anything about knowledge in Chapter 2 and that this subject is introduced only in Chaptet 4.33 does not seem to be correct. As I had mentioned in my initial comments, verses 11-38 in Chapter 2 deal entirely with the path of understanding, Samkhya,p or Jnana yoga. As you know each of these texts have been interpreted differently by different teachers. The commentary on the Gita by Ramanuja is different from that of Shankara. There is also a good deal of difference of opinion on the interpretation of the second line of the first verse of Ishopanishad, Tena tyaktena Bunjita. I had an interesting discussion with Dennis Waite on Advaita Vision.org and had pointed out that eight teachers, including Shri Aurobindo had disagreed with Shankara on the translation. As I had said earlier, I will go through the whole subject once again and get back to you soon. However, if the reordering of Chaptet 3 and 4 makes better since to you, it is good for you. I for one, feel that the present ordering correct for reasons given earlier. In fact, in the end, all this does not matter. The teachings are only pointers and the Sadhaka should go behind or beyond them and understand and practice the essence of the teaching. If your point of view is correct, one of the many commentators on the Gita would have mentioned it. To my knowledge, no one has. Incidentally you have said the Gita is not perfect for many reasons. Have you discussed this in one of your posts? I would like to know why you consider it to be imperfect. Hi Gurudas, nice to hear from you. Just to fully clarify, are you also vipasak? I think what we can agree on what you write: ‘In fact, in the end, all this does not matter’. This entire discussion is actually quite a minor point, which doesn’t necessarily change the major content of the teachings of the Gita, but an interesting one for myself given my love for the Gita its role within my personal journey. I do feel it flows better with the chapters swapped, but as you rightly point out, no other major commentator (as far as I am aware) has mentioned this and I could well be wrong. I’m interested to see what you come back to me with. In terms of the Gita’s imperfections, one of them is how the teaching is not always that specific, it is open to various imperfections and interpretations. Words and terms are not often used in a consistent way, their meaning often varying depending on context, and words/terms are often not clearly defined. The entire idea of Krishna inciting someone to kill is itself quite contentious and is easily open to malign interpretation. Several commentators state the battle in the Gita is a metaphor for the inner battle within each of us, but this is not clearly stated anywhere in the text, unfortunately. Whilst this criticism can be made of many texts, it doesn’t have to be that way, and teachings are able to be more specific. That said, the fact that the Gita is often quite vague and open to multiple interpretations may be one of the factors why it is so popular – people can superimpose their own view onto the Gita to some extent, and often use it to justify their point of view. This is much more difficult with the Buddhist Pali texts, for example, in which words are usually clearly defined, objectives and practices clearly set out and the principle of non-violence/ahimsa is clearly proposed. The sequence which you have posted surely makes more sense. It seems to be an error., which has skipped minds of readers and speakers, since centuries.